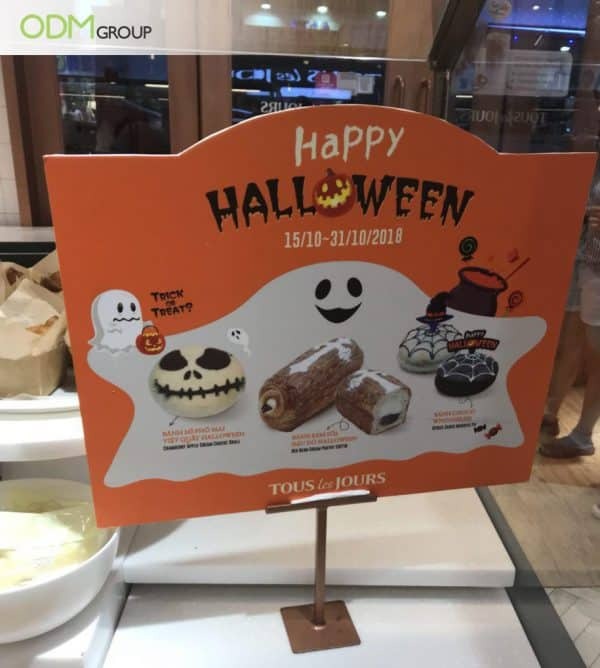 Joining the spooky season is Tous Les Jour Vietnam with their custom design display to get customers to celebrate with them! The custom display stand is in orange, the color of Halloween, promoting loaves of bread that are specially curated for the festive holiday! The design cutely portrays their special Halloween-themed bread lying on the ghost as their background. Certainly appropriate for this period! 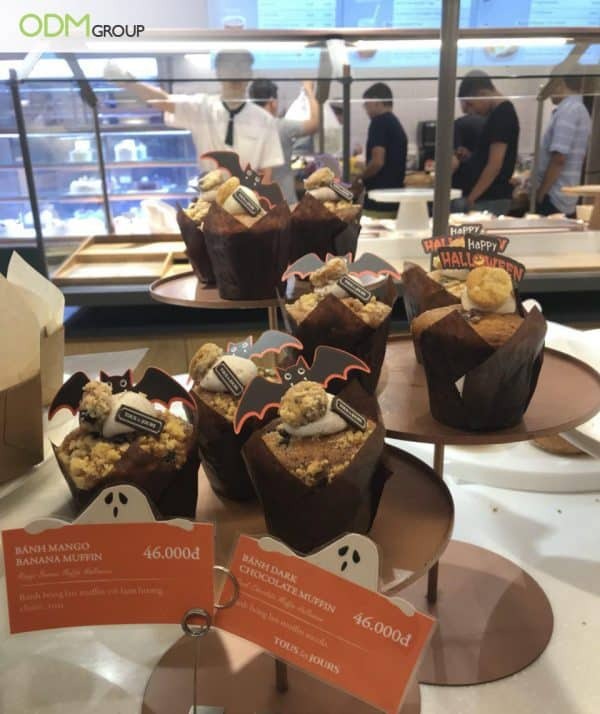 They decorated the muffins with Bats and ‘Happy Halloween’ greeting tag, which set the spooky mood. Moreover, price tags are created in line with the holiday. Why Include Festive Custom Design Display in Your Marketing Campaign? Inclusiveness – the custom display gives brands a way to relate back to their consumers. By doing so, brands stay competitive by knowing how to connect with their customers. Moreover, it is a good time to reward customers through exclusive promotional offers. Hence, brands can certainly remain on top of their game in the industry. Leveraging on Occasion to Increase Sales – Shoppers who patronize the bakery have the intention to buy. With such ongoing one-time promotions, they would be more inclined to purchase. Hence, they are more willing to spend which increases overall sales. At ODM, we have a wide experience in manufacturing desirable custom POS Displays that will fit any occasions and certainly meet your standards. Feel free to drop us an inquiry today! If you’re searching for product innovation ideas, don’t hesitate to contact Mindsparkz team. You can always head over Promo Gift Blog or Movies Marketing to get inspired from various kinds of promotional campaigns! Walmart CNY In Story Display Decorations Certainly Stunning!